The primary symbol which represents almost every yacht club or boating organization is its “burgee”, the flag which displays its colors and logo. 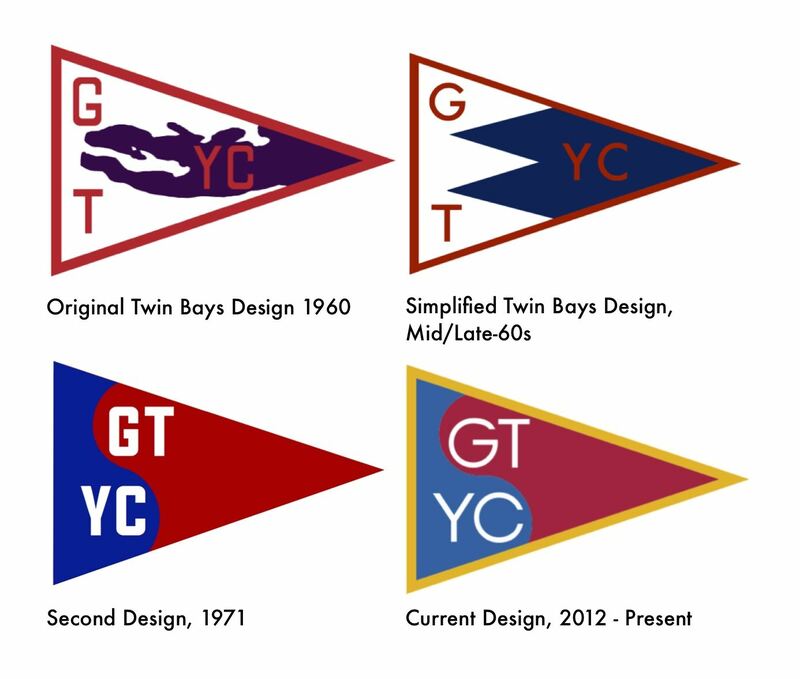 The original burgee of GTYC created in 1960 was the “Twin Bays” design, with the unique representation of the whole of Grand Traverse Bay oriented with the southern base of the bays along the hoist, West Bay running at the top of the fly of the pennant, and northern mouth of the bay at its point. The letters “G” and “T” were displayed vertically along the hoist, while “Y” and “C” were placed in the waters of the bay past Old Mission Point. In the first years of the club, a small number of club-owned burgees could be signed out by members for use. Various models of the burgee blue, red, and white used interchangeably among the elements of the burgee over successive production runs. The pennants were manufactured locally, and undoubtably the complex nature of the construction of the detailed representation of the bays’ geography added to their cost and scarcity. A simplified geometric version of the Twin Bays was also used by the mid-60s which refined the outline of the bays to two blue triangles. In the fall of 1971, member Lee Stephenson asked to present to the Board new designs for the burgee and a logo patch. By January 1972, member Marcia Schroeder developed the new design of what is now called the “ying-yang” design of balanced and interlocked circles of red and blue with “GT” in the blue portion above the red portion containing the “YC”. The patch would be the same “ying-yang” design which became the GTYC roundel commonly used since in club signage, merchandise, and communications. This design, which would evolve to the present burgee, was approved by the board in March 1972. Originally, the new burgee design was without contrasting trim, but on occasion white edges were used. Later versions added gold trim to the bind the edges on the upper and lower fly. 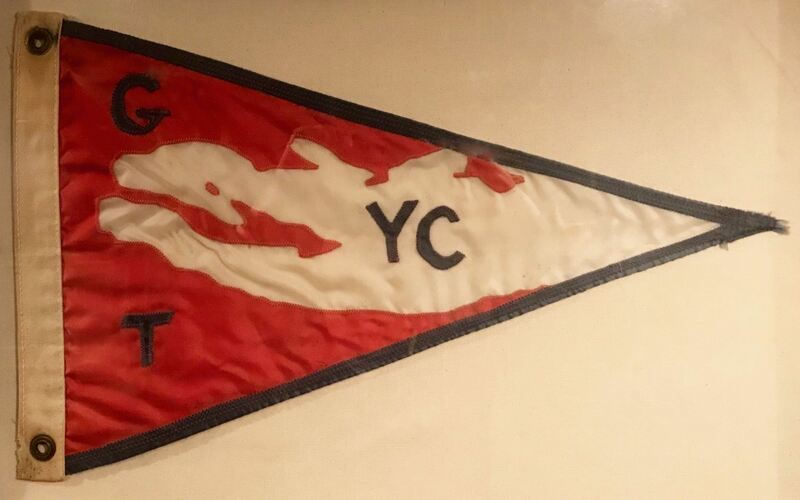 It was not until 2013 that the club burgee, in its current form, became defined by club policy.